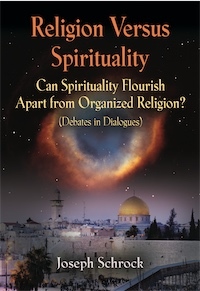 This book poses questions about whether true spirituality requires organized religion. It consists of dialogues between three imaginary characters: An independent spiritual seeker, a devout Christian, and a devoted skeptic about religion and spirituality. These three characters engage in passionate debates. This is a book that is devoted to helping inquiring spiritual thinkers find a path of genuine spirituality that leads them into spiritual growth and true harmony with the Divine. Three imaginary characters intensely and passionately debate questions concerning the reliability of Judeo-Christian scriptures, questions about whether the concept of original sin (in the Garden of Eden) is a viable concept for the twenty-first century, etc. Intense debates flare over questions about sexual morality, whether Pauline theology can be regarded as credible in our age of scientific knowledge, whether Heaven and Hell are real, and numerous other issues that are of vital concern to spiritual seekers. The three debaters in these dialogues are: 1) An independent spiritual seeker, 2) A Christian apologist -- devoted to a defense of mainstream Christianity, and 3) A devoted skeptic who questions all things religious or spiritual. If you are a spiritual seeker, one who finds that the materialist/secularist scientific paradigm for all reality leaves you cold, this book can engagingly point you in the direction of ever-deepening spiritual insights that will enable you to progressively advance toward genuine harmony with Ultimate Reality -- the Creator and Ruler of our wondrous universe. This book can show you that you need never to abandon intelligence, logic, science, or clear and rational thinking in order to attain a profound spirituality. True spirituality need not be imprisoned in the straitjackets of dogmatic or narrow thinking about reality. The Divine whom you can learn to serve faithfully and devotedly does not demand of you a repudiation of your God-given intellect, and God is never scared of humble and earnest questions. It was not stated flippantly nor erroneously that in regard to true spirituality, "Seek and you shall find; knock and the door will be opened to you." Many of the claims made in this book incorporate the conviction that one must not necessarily buy into the theology of any extant organized religion, but can have a "direct line" to the Creator, receiving thereby inspiration, encouragement, empowerment, inner peace, and growth toward spiritual perfection. For many in our "scientifically enlightened" age, religion is pushed into the "backwaters", and passionate devotion to spirituality is regarded as passe. This need not be so, because the Divine permeates every atom in this universe, and the energy that sustains the universe is also highly willing to inspire, direct, and guide your life. We need not settle for science as the "new god", because powerful though it is as a wonderful instrument, it is nevertheless constrained by the limitations of human powers and our relatively puny intellects. Your life can transcend what science has to offer, because science is bereft of powers to master the mind and the spirit of humanity. By availing yourself of the hints and guidelines offered in this book, you can discover a glorious path of growing inner peace and joys that transcend the powers of human understanding. Freedom of your will opens for you the door to genuine choice -- a choice that could (potentially) have the significance of Heaven versus Hell. The author is a devout seeker after harmony with Ultimate Reality (God, in other words). He has studied philosophy and mathematics at a state university -- at the undergraduate levels. The author believes wholeheartedly that a search for Union with the Divine is the most vital concern to which a human being can devote oneself.